As 2016 comes to a close, the consulting firm Deloitte is busy hiring employees in the Washington area — listing a total of 392 jobs open in the region with “federal” in the job description. According to its website, the firm is looking to hire a federal contracts manager, a federal cybersecurity consultant and is even advertising for military officers with top-secret government clearances. What none of the people applying for those jobs know — and few of the people doing the hiring know, either — is the secret history of Deloitte’s robust federal practice. It’s a story that goes back a decade, and has never before been told publicly. It involves several veteran CIA officers, an undercover mission and a huge haul of extremely valuable intelligence. The saga shows just how intense the competition between major accounting firms is, and just how willing they can be to engage in tactics that don’t exactly mesh with their buttoned-down corporate image. It’s a classic tale of corporate espionage. Then, in early 2007, a phone rang inside Deloitte. On the line was a source, passing on some valuable information. BearingPoint, the struggling consulting firm, had just called an emergency meeting. BearingPoint partners from around the world would be coming to a hastily scheduled session at the convention center in Orlando, Florida. The source didn’t know why the meeting was scheduled. It was a complete mystery. But Deloitte’s managers were prepared to go to unusual lengths to unravel it. Deloitte had an internal team to call on in just such a moment. Although its name changed over time, the group was generally known as the competitive intelligence unit, and it was led by a trim former CIA officer with piercing eyes named Gordon “Gordy” Welch. His number two was John Shumadine, who had served as an economist for the CIA and, like his boss Welch, was an Army veteran. Shumadine, according to his LinkedIn profile, had served as a military intelligence analyst scrutinizing Iraqi Scud missiles and special-forces operations. Welch said he had been in leadership roles in the 82nd Airborne Division and served as an instructor at the Army’s Ranger school. Neither Welch nor Shumadine commented for this article. The two CIA officers oversaw a team at Deloitte that was divided into two main categories: collectors and analysts. Collectors uncovered information that could be valuable to Deloitte’s senior managers. Analysts poured through that information, combined it with other known facts and developed narratives about what they thought was going on behind the scenes in the offices of Deloitte’s clients and customers. “Our job was to spy on Ernst & Young, PriceWaterhouseCoopers, KPMG and some of the consulting competitors,” said a person who worked in the unit. “We were trying to steal their pricing models, how they determined discounts, and especially new product lines or service lines.” The team developed networks of ex-employees as sources and traveled to trade shows to gather information. The last piece of the team was known as “win/loss.” That group conducted after-action reports on efforts to win major accounts to determine what had gone right — or wrong — with each sales pitch. They stood up a full time office in at Deloitte’s offices in suburban Virginia, where managers and analysts could coordinate the operation. Deloitte officials also checked in with the firm’s general counsel to sort out what they would be legally permitted to do. With the analysts in place, it came time to select the collectors — the actual on-the-ground agents who would book hotel rooms near BearingPoint’s meeting at the Orlando convention center and spend several days trying to figure out what was going on. But all that lay in the future. 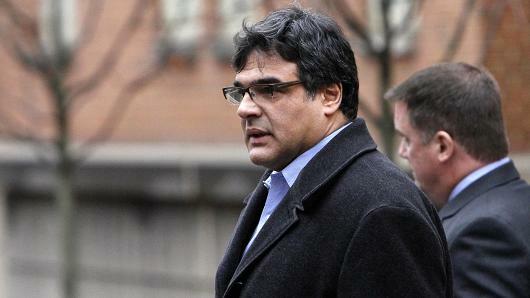 In early 2007, Kiriakou was simply a collector for Deloitte’s corporate intelligence unit, and he was on his way to Orlando to try to piece together what the BearingPoint partners were up to. Vietor and Kiriakou declined to comment for this article. On the ground, the two Deloitte employees assessed the situation. BearingPoint was clearly in crisis mode, and the firm’s partners appeared in to be disarray. This offered an opportunity for the two collectors from Deloitte: At various points over the coming days, the two Deloitte employees walked in and out of the convention center and stationed themselves at a bar, picking up scraps of conversation from the distraught BearingPoint partners. According to a person familiar with the operation, the two agents also spent a considerable amount of time in the men’s and women’s bathrooms — hiding out to avoid detection, and taking notes on conversations they overheard. “You can’t believe what people will say while they’re in there,” said a person who participated in the operation. That’s because the agents on the ground uncovered a valuable piece of intelligence. BearingPoint’s financial situation was dire. And as a result, the partners were considering selling the firm’s federal practice — a business that could be a perfect solution to Deloitte’s own problems in the federal space. But how much was BearingPoint’s federal practice actually worth? That would depend on key details such as whom the firm’s clients were and how much those clients were paying every year. Then Deloitte’s agents in the field made a breakthrough: They learned that senior BearingPoint officers were holding a break-out session, and they figured out the location for the high-level meeting. Deloitte’s team decided that any paperwork the BearingPoint managers left behind would be fair game for the agents to pick up — but only after several hours had passed, making it clear that the material had been officially abandoned. The Deloitte collectors scooped up everything they could find, and headed out to a nearby Kinko’s to fax it directly to the analysts in Virginia, who could begin teasing out the full implications. People involved in the operation say the intelligence gathered in Orlando gave Deloitte a leg up in understanding just how valuable BearingPoint’s federal business could be, despite the financial difficulty facing the overall firm. It wasn’t until March 2009 that Deloitte was able to take advantage of that opportunity. That month, Deloitte announced it would buy BearingPoint’s North American public services unit for $350 million in cash as BearingPoint worked through a bankruptcy. Despite the success of the operation in Orlando, people familiar with Deloitte’s intelligence team say the unit was wound down over the following years, its employees leaving for other firms and other careers. Only a small number are still employed at Deloitte.